Google Executive Chairman Eric Shmidt on Thursday responded to comments made by Apple CEO Tim Cook referring to the Internet search giant's privacy policies, saying Cook is misinformed and that Google's systems are "far more secure" than anything Apple has. 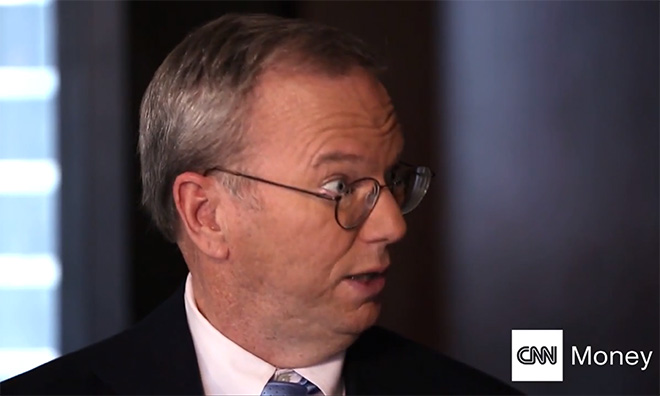 In an interview with CNN, Schmidt told CNN Money anchor Christine Romans that Google is a leader in data privacy and any contention to that fact, such as a recent missive from Cook, is incorrect. Schmidt is currently on tour advertising his new book "How Google Works" with co-author and Google SVP Jonathan Rosenberg. "Someone didn't brief him correctly on Google's policies, that's unfortunate for him," Schmidt said of Cook. "In Google's place, we have always been the leader in security and in encryption. Our systems are far more secure and encrypted than anyone else, including Apple. They're catching up, which is great." As part of Apple's recent push for consumer privacy, Cook last month published an open letter to the company's website, reinforcing that iCloud user data is not only secure, but will never be monetized. A section of the note suggests unnamed service providers harvest sensitive user information for monetary gains, a business model to which privacy advocates are vehemently opposed. A few years ago, users of Internet services began to realize that when an online service is free, you're not the customer. You're the product. During today's interview, Schmidt said, "All the things [Cook] implied we're doing, we don't do." The Google exec did, however, note that Gmail does display ads to users, something the company has done for a decade. He quickly pointed out that information gathered in the email ad serving process is used "for nothing," but did not elaborate on the subject. Romans asked Schmidt what he thought about recent comments from Julian Assange, who said Google shares a business model with the U.S. National Security Agency. Schmidt attempted to extricate Google from the arguably negative comparison by saying the NSA does not have a business model because it is funded by the government. Aside from stating the obvious, he said Google does not work with the NSA in any way, adding that the two parties have never "talked." Schmidt was not asked whether Google is or has been complicit in handing over user data to the beleaguered state agency. "I think Julian needs to do a little bit more research from the safety of the embassy," Schmidt said. Assange is currently eluding extradition by living out of the Ecuadorian embassy in London. Schmidt and Assange have a bit of a feud going, as Assange's latest book "When Google Met WikiLeaks" was released one day following "How Google Works." The remainder of the interview deals with general data privacy, diversification in the workplace and Google's corporate culture.